Service manual from the original manufacturer. Detailed instructions and specs to aid in servicing your ATV or Motorcycle. Very detailed and descriptive. The torque specs are very handy. It also has many diagrams. it's helps a lot to have one before you start working on any bike . It's easy to find what other things go back together and for the torque specs ! I highly recommend getting one for all your bikes . I like to do as much of my own repairs as I can and this manual will help me to do that. This Owner's/Service Manual was exactly what I needed, as advertised, and got to me quickly. Crappy pictures,looked like they were copyed from another book.se of the steps were left out. Unfortunately only manual out there for this machine. Awsome details in this manual. a must have for any bike. As long as you know what your looking at on the machine and you know how to follow the procedures its pretty helpful. BUT if your relying on the pictures to show you, forget it! The pictures are very dark and its hard to see what there showing you to do!! I think its photo copied from the original and the pictures came out very poor!!!! Good manual and tells you what you need to know. This is the poorest and MOST expensive manual I have ever purchased! The first thing I buy for a bike is the factory service manual and I've had plenty. This doesn't even have an index! I find myself wasting time searching cover to cover to find what I'm looking for. Unfortunately, it's probably still the best manual out there. This manual lacks a lot, to start off it doesn't have an index so if you want to find all the places a pilot screw is mentioned, you have to find all the places a pilot screw is mentioned, unheard of in an informational manual. The second problem is the lack of step by step instructions "Follow the pictures" is not step by step instructions and the pictures are poor quality, hand drawn. The trouble shooting is very poor. Carburetors on these machines cause a lot of trouble, the carburetor section doesn't even include a trouble shooting section, just follow the picture till you hit on the right part that fix's your problem. It's a glorified picture book at best. Can you see the break down of parts? Yes. Does it help? Yes Is this a shop manual worth a cent more than a Haynes? Definitively not. Haven't seen a Haynes for atv's but will buy one as soon as I do. I love shop manuals, this one is by far the worst I've ever bought and I didn't feel the slightest bit bad about paying for a good one, I just wish I would've gotten what I paid for. Nice manual well written, nice pics and just about everything you need to know to fix your Yamaha Blaster. Factory manuals always make it easy to narrow down what is wrong. Love the manual except my machine is a 2003 Yamaha Blaster. I ordered the proper manual yet received the 1988-2001 edition. Sorry, but I need to return this bible. I use this a lot when workin on my bike. I am fairly new, so I need it for reference. It has a lot of useful info, torque specs, ect. It is a little tough to navigate, which is the reason for only 4 stars, but I always seem to find the info I am looking for. Much cheaper than buying from the dealer. Covers everything, though some areas are a bit skimpy on detail. This is a must-have for anyone who does their own wrenching. good product but some of the picture diagrams are very hard to see (very dark) like they were scanned in from another book. This manual pays for itself the first time you use it. You may not be able to do everything,(I know I can't) but things I didn't feel comfortable with now I am doing. Just doing the small maintenance jobs has saved me a lot of money. Which let's me put money where I want, my 4-wheeler. This Manual is very detailed and explains most of the work that needs to be done. Some of the pictures could be a little bit better but with a little bit of technical understanding everything should be possible to figure out with this manual. I would buy it again for another bike. You can buy cheaper manuals, I have. I never will again, there is much more information in these! These service manuals are a bit pricey but overall worth their weight in gold! This is a great investment it will save you alot down the track , its easy to understand instructions so you can fix all you need to on your bike instead of having to pay heaps for someone else to do. This product was definately worth the money. It completely breaks down the bike and gives you a step by step guide of how to maintain, fix and troubleshoot your quad. Great purchase and really do reccomend that everyone ahve one of these service manuals. This manual was obviously translated by someone who does not have full command of the english language. The pictures are good but the drawings are better. The assembly flow charts are confusing and not really useful to the average person, maybe these were for the Yamaha technicians in school or something. Yamaha should know better. Unfortunately there really is not a better option to get all of the torque values and specs. is the manual have the french version??? BEST ANSWER: The version I received was in english only. The manual that I have is in English only. If I have a 2007 Yamaha banshee 350, do I enter it in as a 2006? I say that because it doesn’t give the option to. Is a 2015 yz85 same as a 2014 for service manuals? BEST ANSWER: Service manual that I purchased was for the Grizzly ATV. yz85 I believe is a mtorcycle. So I have no answer for you. Sorry. 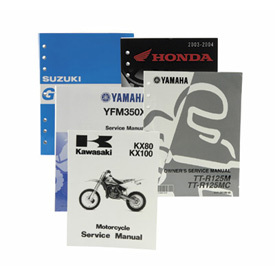 Is 2006 or 2008 manuals compatible for the 2007yz450f? BEST ANSWER: No, the manuals are pretty different between the 2006 and 2007. This is Brannon Baker. I have a 2000 Yamaha yz250. I noticed in the YEAR filter it skips to 2002 from 1999. I am looking for the oem yamaha owners manual for 2000. Is it available or inclusive in the 2002 oem manual? BEST ANSWER: Unfortunately we are not carrying the owners manual for the YZ 250. I'm sorry for any inconvenience.